With the cancellation of Neil Young And Crazy Horse's Remaining N. American Concert Tour Dates, there has been quite a bit of gnashing of teeth over how this all should have been handled. We thought that Billy Talbot's Straight From The Horse's Mouth comment answered the question quite succinctly. At least for us it did. Not so much for others, it seems. Q: I’ll ask the obvious question about Neil Young and Crazy Horse cancelling their appearance at your festival. Why doesn’t Neil just come and play solo? Daniel Lanois: That’s the natural response and instinct. Why not show up and do something else? People would have been just as happy to hear Neil sing non-Crazy Horse material. I didn’t speak to Neil about this, but I believe it was asked of him. The response from his manager was that his head was not there. Q:You and Neil have a relationship. He didn’t give you the news personally? Daniel Lanois: I heard from him about three weeks back. He was excited about coming in. But I guess the injury happened since. The communication since then has just been through an agent. Q:So, what happens when you get bad news like this? 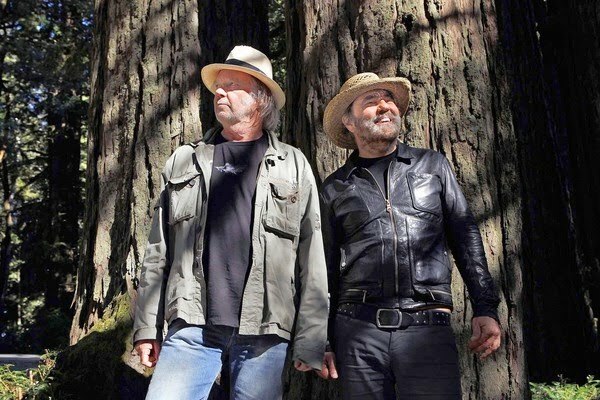 Daniel Lanois: Well, my thought was to see if we could get someone else to fill that position. Lucky for us, Gordon Lightfoot made himself available. And I can’t say enough about it. What a great guy to help us out so late in the game. I mean, we’re right down to the wire here. But, one great Canadian icon fills in for another. That’s how I’m looking at it. There you have it -- "his head was not there." What more of an explanation do folks need from Neil Young? "One great Canadian icon fills in for another." And on goes the show. More of interview What does Daniel Lanois do when Neil Young and Crazy Horse are forced to cancel? - The Globe and Mail. Is it strange I should change? I don't know, why don't you ask her? OMW: "his head was not there"
We all know that Neil always follows the muse, no matter who it affects. I, for one, take this as a great sign that his head is still with The Horse. I was worried that Poncho's injury would cause Neil to go off in another direction. These shows with Crazy Horse are the best I've ever seen. If it takes a few cancelled shows to keep The Horse running strong, I'll gladly take it. Neil seems so happy with The Horse at this point in his life and I hope they keep playing together for years to come. If you think I'm being inconsiderate of the fans that have to miss Neil this time, I had tickets to the Greenbelt Harvest Picnic. However, keeping The Horse alive is more important. Artist vs performer. Neil kind of owes his audience to play, but on the other hand you really don't want to see Neil Young if he is bored or doing a show against his will. The point of view of Lanois and the most of fans is reasonable and intelligent, but really the Neil's head isn't there. All the Neil tours(solo, CSNY, Buffalo Springfield, Crazy Horse, etc) are carefully thought and prepared for months. There's a lot of preparation behind. The actual Neil probably can't change a show in few days/weeks. Gordon Lightfoot alternates about 30 songs in his shows, but substantially the show hasn't changed a lot in the years, so he could replace his historical, longtime lead guitarist Terry Clements, after his sudden passing in 2011. Terry Clements died on 20 February 2011 and Carter Lancaster replaced him for the 15th March show at Greensboro, NC and the following dates. Carter Lancaster is still the Gordon Lightfoot's guitarist. I would have loved to see Neil Young solo instead of the cancelled Gotenburgh show (we did not get any refund at all, btw). But only if he was totally comitted to it. What makes a Neil Young and a Neil Young With Crazy Show so great is the playing with his/their hearts outside the t-shirts. I don't want to see Neil reduced to a karaoke machine. On Unplugged it's very audible too that Neil's 'head wasn't there'. You really hear how annoyed and pissed off Neil is. The interplay with his band is very strained and tense. So how did Poncho break his hand? Which one? Neil contributed to our screwing in Ontario. We paid $150.00 for tickets to see Neil Young and friends. We got $40 back when Neil cancelled. There was no one else of comparable value to fill in. Gordon Lightfoot does not compare to a 2 hour Crazy Horse show. Bought these tickets through Neil`s website, wrote letters to the ticketing agent that they should be helping us out to get a full refund. Nothing returned or done by them that I know of. Neil never shows his fans the kind of loyalty that we give him. You guys can all say what you want, but if it was you who was stuck with 4 tickets to a crappy show instead of Crazy Horse, you wouldn`t be so chipper about it. "His head was not there". HA! Yes it's Neil, and we've all learned through the years that he marches to his own tune, but I defy anyone here to use that same excuse with their boss/significant other/family member, etc when you don't want to do something. We all have bosses, as Bob Dylan said: you got to serve somebody. Neil's 'somebody' just happens to be his fans. Imagine this scenario - ME: Hi Boss, I'm not going to be showing up for the next 11 very crucial presentations in the coming two months. I know they're important and I know that a lot of time and effort have been expended to make these things happen, plans have been made months in advance, money spent, etc., and I'm certainly aware that I'm the pivotal member of the team and everything will fall apart without me, but my head's just not into it. Boss: Well why won't you show up? Me: The attorney that I always use hurt himself. Boss: And there's no other attorney that you can work with? Me: Duh, of course there are others, I worked with plenty of others in the past, but this attorney, it's just that we work so well together and to make a change now means I'd have to do a whole lot of extra work under a lot of pressure just to please some stupid customers that I don't care about, and well, my head's just not there. Boss: I happen to care a lot about our customers, seriously, you can't change on the fly and accommodate someone else's needs for once, even though it's entirely possible? Me: Yep, that's correct. Boss: Please clean out your desk and pick up your final check at HR on your way out. Me: Phew, at least I followed my muse no matter who got inconvenienced. Luckily I'm rich so I'll certainly be fine, screw the lot of 'em if they don't like it.